Zoila Gutierrez (left) is a student in the Encuentro home health aide class in Albequerque. Though her youngest daughter is a citizen and two older kids are registered under DACA, Gutierrez doesn't have papers, and knows she may have to leave her job and return to Mexico. 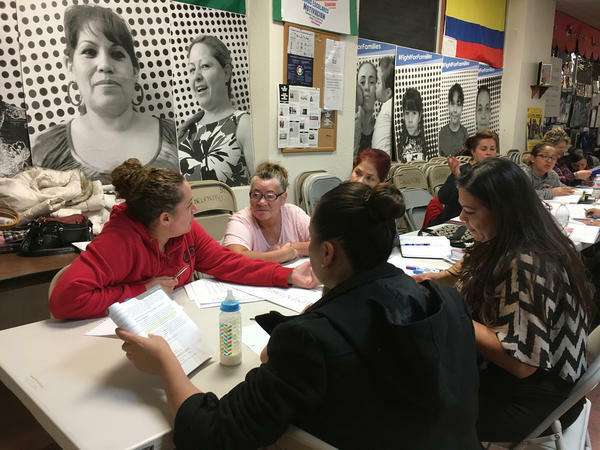 Liliana Reyes instructs a home health aide class on human biology at Encuentro, an immigrant education center in Albuquerque. State-certified graduates of the program help elderly and disabled clients with activities like bathing, dressing, and taking medication on time. On a rare rainy night in Albuquerque, two dozen students are learning the proper way to care for older people. Teacher Liliana Reyes is reviewing the systems of the body — circulatory, respiratory and so on — to prepare them for an upcoming exam. These students are seeking to join a workforce of about 3 million people who help older adults remain in their homes. They assist these clients with things like bathing, dressing, and taking medication on time. About a quarter of these workers are immigrants. But as Congress and the White House consider changes to immigration policy, some people in the home care industry worry that there won't be enough people to care for the nation's growing number of elders. What makes the Albuquerque class unusual is that it's taught entirely in Spanish. All of the students are immigrants, mostly from Mexico. The course is a joint project of Central New Mexico Community College and a community education center for immigrants called Encuentro. Everyone who passes the course becomes a state-certified home health aide. But some of these students already care for older adults, even though they've lacked training. Zoila Gutierrez says the first job she had in this field paid $6 an hour for a shift that lasted from 7 at night to 7 in the morning. "This course is going to open a lot of doors for me in terms of being able to get better work," she says. "But most importantly, I want to know about all the rules that I must follow to provide good care." Gutierrez has a complicated life. She's 42 years old and came to Albuquerque from Mexico in 2004. She doesn't have papers. Her youngest child is a citizen. Her two older kids are both registered under DACA, the Deferred Action for Childhood Arrivals policy. So, at the same time she's studying to improve her prospects in the United States, she and her children also discuss the possibility of going back to Mexico. "We must have a Plan B," she says. "We don't want to give up our dreams, but we must think in the 'What if?' So, no, we don't want to leave. But it's an option." While Gutierrez worries about the Trump administration's crackdown on illegal immigration, others working in home care worry about the administration's proposals for restricting legal immigrants. President Trump wants to focus on highly skilled, well-educated workers. But the policy change that would hurt the home care industry the most would be limiting family reunification, sometimes called chain migration. That's according to Robyn Stone, senior vice president for research at Leading Age, which represents the nonprofit side of long-term care. "This immigrant population primarily came to the United States through family reunification," says Stone. "If we shift in our policy [on] immigration, the pipeline for this workforce could be substantially affected." That's not just a theoretical concern for Sherwin Sheik. He's the founder and CEO of a company called CARELINX, which he describes as a cross between Uber and Match.com for connecting home care workers with clients. "It takes a very special person to want to do these jobs," Sheik says. "They tend to be immigrants. If we have tighter policies, it's going to impact the industry, without a doubt." The nation's rapidly aging population has made personal care assistants and home health aides (who have more specialized training around health issues) the fastest growing low-skilled occupations in the U.S. But Steven Camerota isn't worried about a shortage in home care workers. He's the director of research at the Center for Immigration Studies, which advocates for restrictions on immigration. He points out that, despite the growing immigrant workforce, three-quarters of the people currently providing home care were born in the U.S. There's no mystery to what it would take to increase that percentage, says Camerota. "Raise wages. Treat workers better." Home care workers sometimes make as little as $10 an hour. At the same time, he says, "we have an enormous supply of less-educated [American citizens] currently not working who could easily fill these jobs if employers treat them reasonably well." But this work isn't just a matter of money for Zoila Guttierrez. She finds meaning in taking care of older people. "I like to care for them and make sure they're doing well — that they're OK," she says. It will take at least a million more people who feel the same way to meet the needs of older adults over the next decade, whether those workers are immigrants or American-born. It takes a workforce of about 3 million people to help the elderly stay in their homes. These workers help with bathing, dressing and taking medication on time. A growing percentage of them are immigrants. So the home care industry has an interest in federal immigration policy, and some in the industry worry that tighter immigration controls could mean fewer people to care for the nation's growing number of elderly. Here's NPR's Ina Jaffe. INA JAFFE, BYLINE: On a rare, rainy night in Albuquerque, two dozen students are learning the proper way to care for older people. JAFFE: That's Liliana Reyes. 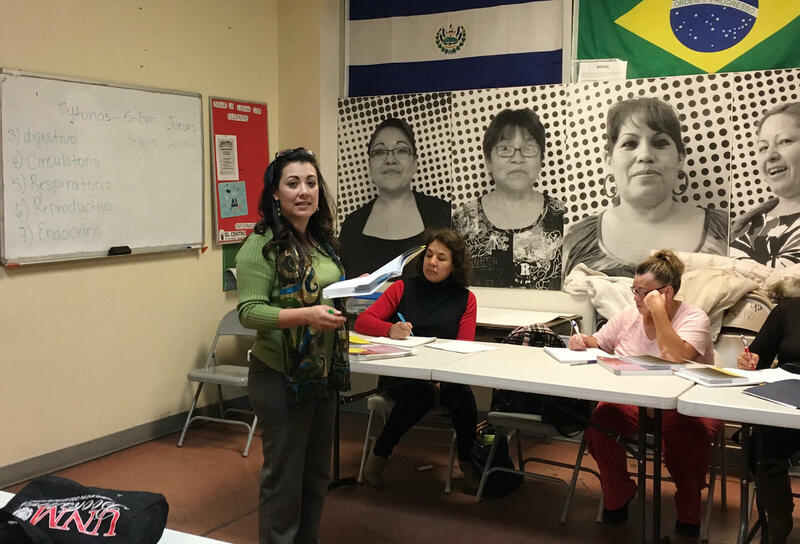 She teaches this class in home health care at a community education center for immigrants called Encuentro. JAFFE: The course is given in conjunction with the local community college. Everyone who passes it becomes state certified as a home health aide. But some of these students already care for older adults in their homes, even without training. Zoila Gutierrez says the first job she had in this field she worked all night and made 6 bucks an hour. ZOILA GUTIERREZ: (Through interpreter) This course is going to open a lot of doors for me in terms of being able to get better work. But most importantly, I want to know about all the rules that I must follow to provide good care. JAFFE: Gutierrez has a complicated life. She's 42 years old and came to Albuquerque from Mexico in 2004. She doesn't have papers. Her youngest child is a citizen. Her two older kids are both registered under DACA, Deferred Action for Childhood Arrivals. So at the same time she's studying to improve her prospects in the United States, she and her children discuss the possibility of going back to Mexico. GUTIERREZ: (Through interpreter) We must have a plan B. We don't want to give up our dreams, but we must think in that what if. So, no, we don't want to leave, but it's an option. JAFFE: While Gutierrez worries about the Trump administration's crackdown on illegal immigration, others in home care worry about the administration's proposals for restricting legal immigrants. President Trump wants to focus on highly skilled, well-educated workers. But the policy change that would hurt the home care industry the most would be limiting family reunification sometimes called chain migration. That's according to Robyn Stone, the senior vice president for research at LeadingAge, which represents the nonprofit side of long-term care. ROBYN STONE: This immigrant population primarily came to the United States through family reunification, and if we shift in our policy around immigration, the pipeline for this workforce could be substantially affected. SHERWIN SHEIK: Oh, I know it would impact my workforce if we actually start clamping down on immigration. JAFFE: Sherwin Sheik is the founder and CEO of a company called CareLinx, which he describes as a cross between Uber and Match.com for connecting home care workers with clients. It's a booming business. The skyrocketing number of older adults has made home health and personal care aides the fastest growing low-skilled occupations in the country, and immigrants hold a quarter of those jobs. SHEIK: It takes a very special person to want to do these jobs. They tend to be immigrants. And if we have tighter policies, it's going to impact the industry, without a doubt. JAFFE: But Steven Camarota isn't worried about a shortage in home care workers. He's the director of research at the Center for Immigration Studies, which advocates for restrictions on immigration. Three-quarters of current home care workers were born in this country, says Camarota, and you want to attract more American-born workers to this field? STEVEN CAMAROTA: Raise wages. Treat workers better. And we have an enormous supply of less-educated people currently not working who could easily fill these jobs if employers treat them reasonably well. JAFFE: But it's not just a matter of money for Zoila Gutierrez. She finds meaning in taking care of older people. GUTIERREZ: (Through interpreter) I like to care for them, and I like to make sure that they're doing well, that they're OK.
JAFFE: And it will take at least a million more people who feel the same way to meet the needs of older adults over the next decade, whether these workers are immigrants or American born. Ina Jaffe, NPR News. (SOUNDBITE OF AMBROSE AKINMUSIRE'S "VARTHA") Transcript provided by NPR, Copyright NPR.